I used to think that I needed a big platform to make a difference in the world. I thought that the only way I could contribute something is by becoming a pastor, singer, or anybody that was famous and who people idolized in a country. Boy, was I wrong. While I do acknowledge that famous people or people that are recognized do make a significant difference in various ways, you do not need to have a big platform to make a difference in the world or in the country you live in. You do not need to be a president or a leadership position to do that either. What you need is yourself. “How,” you ask? Well first, you can use your gifts, talents, and ideals to make a difference. After discovering who you are, you can start by making a difference in your family. Contribute suggestions of how you want something to be done. For example, you can suggest that your family should be have a Bible study every Sunday evening, or you can suggest that every week your family should meet and discuss about how their week went. What were the positives? Negatives? You might suggest that you will be cooking for your family on weekends. By doing this you are already making a difference and showing leadership qualities. You can then move to your community and maybe suggest that the community comes up with solutions on how to make that community even better. Young people are creative. As a young person you can find ways in which you can contribute something to your local church. Are you an artist or a writer? Write a poem or draw a picture every month and stick it on the church notification board. Try decorating your church with flowers from your garden. Try being a steward, you can also help in existing programs your church already has in place like feeding the homeless or helping the elderly. These ideas, and many more, are ways you can make a positive difference in the world. From your church community, you can turn to your town, and try to take part in campaigns like keeping your town clean. After that, you can climb even further up the ladder if you desire. With the little you have you can make a difference. It does not matter what position you have, or how many gifts you have. What matters is what you do with what you have. Everyone will be held accountable for what they did with what they had. Are you making any difference in the world today? What are some of the challenges that keep you from making a difference? Are you in a group or organization that is doing something for communities? Would you love to share what you do? Could you share some of the gifts and talents that you have? Make a list of things you enjoy doing, you do well, or areas you feel you are especially gifted. Write at least two ways next to each that you could share those gifts with others. 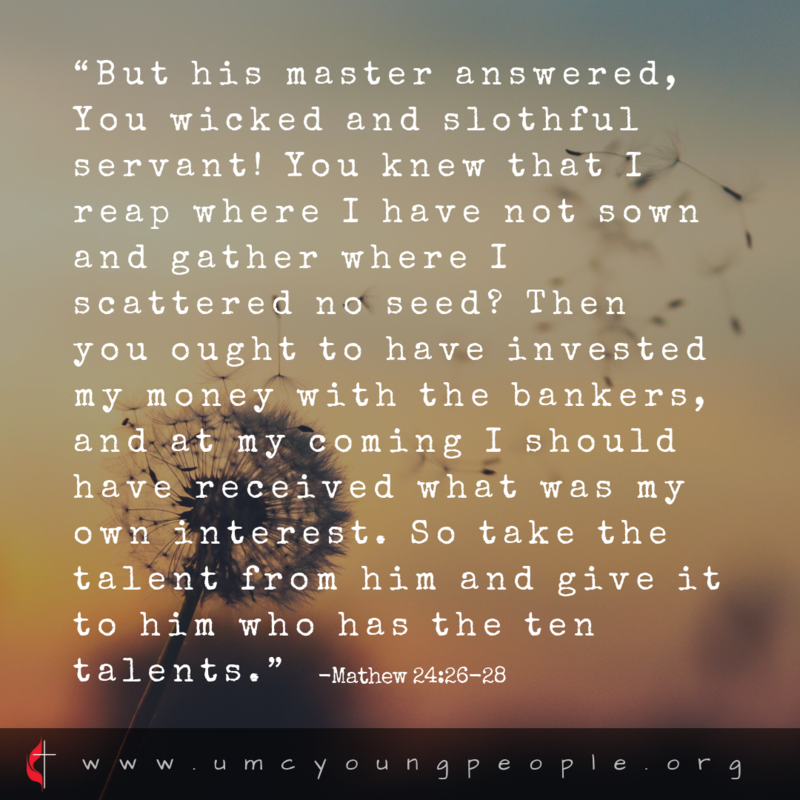 Take the list or email it to your pastor or youth director and ask if they can think of anything the church needs that could make use of your talents.